Imogen and her sister Marin were close as girls, as most sisters are, but dealing with their overbearing and dominating mother pushed them even closer together. But when Imogen went away to boarding school out of self-preservation, she didn’t expect her sister to completely shut her out. After 7 years apart the sisters are reunited at Melete, an artist colony that has jump-started the careers of countless writers, dancers, poets, and other artists. Imogen, a writer, is thrilled at the opportunity for her work to be recognized and the chance to repair her relationship with Marin, a dancer. It isn’t long after Imogen moves into Melete that she starts realizing all may not be as it seems, and there’s a reason so many alumnae of the colony became famous after leaving. There’s a price for success, and she isn’t sure it’s a price she’s willing to pay. Roses and Rot is told from Imogen’s point of view, and we follow her as she moves into Melete, meets her roommates and mentor, and falls for a mysterious sculptor, while also revealing the details about her childhood and the sisters’ reasons for distancing themselves from their mother. As Imogen slowly learns what’s really going on at Melete, she realizes she has to save Marin from a fate she may not survive, while also trying not to damage their already fragile relationship even more. I enjoyed a lot of different aspects of Roses and Rot – it’s part magical realism, part adult fairy tale, without going overboard on either. There are a few twists and turns that keep the story moving and the ending is somewhat expected but satisfying at the same time. 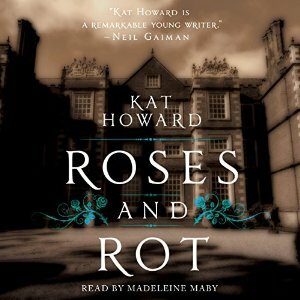 Notes on the audiobook: Roses and Rot is read by Madeleine Maby, the narrator du jour for several books I’ve listened to lately. I enjoyed listening to her read this book as I have with the others.